Dr. M. Duane Nellis was named the 21st president of Ohio University on February 22, 2017. As an internationally recognized scholar and national higher education leader, Dr. Nellis brings nearly four decades of experience in academia as a president, provost, dean and professor to Ohio University. Prior to arriving at OHIO, Dr. Nellis was president of Texas Tech University from 2013 to 2016. While at Texas Tech, Dr. Nellis was committed to enhancing the University’s presence as a top tier national public research university. He led Texas Tech to designation as Carnegie ‘highest’ research activity national research university. The institution was also designated nationally as an Innovative and Economic Prosperity University and received special recognition for university engagement during Nellis’ tenure. 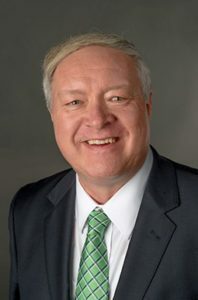 Prior to his time at Texas Tech, Dr. Nellis was president of the University of Idaho (2009-2013) where he led the university toward record enrollments and record levels of fund raising. He also served as provost and senior vice president at Kansas State University from 2004 to 2009 and dean of the Eberly College of Arts and Sciences at West Virginia University, the institution’s largest academic college, from 1997 to 2004. He is recognized nationally and internationally for his research that utilizes satellite data and geographic information systems to analyze various dimensions of the Earth’s land surface. This research has been funded by more than 50 sources, such as NASA, the National Geographic Society, the U.S. Agency for International Development, and the U.S. Department of Agriculture. His research has led to more than 160 articles and reports in a wide range of professional journals, and over 20 books and book chapters, and his selection as a Fellow of the prestigious American Association for the Advancement of Science. Dr. Nellis received his bachelor’s degree in earth sciences/geography at Montana State University in 1976. He received his master’s and doctoral degrees in geography from Oregon State University in 1977 and 1980, respectively. He and his wife, Ruthie, have two adult sons.